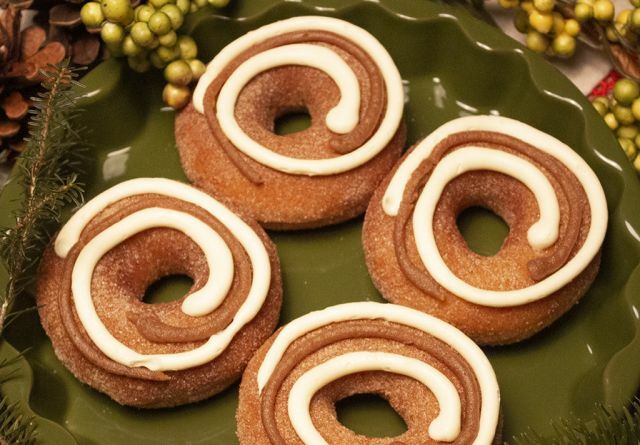 Krispy Kreme debuts the new Cinnamon Swirl Donut this holiday season and will be bringing back the Pumpkin Spice Original Glazed Donut for one week from Friday, November 16 through Thursday, November 22, 2018 (i.e. Thanksgiving). The Cinnamon Swirl Donut is available in the US and Canada and features a yeast ring donut tossed in cinnamon-sugar and topped with cream cheese icing and a cinnamon swirl. The Pumpkin Spice Original Glazed Donut features the chain's signature Original Glazed Donut but with a hint of cinnamon and pumpkin spice flavor in the dough.